It gets harder each year to gather friends to have a nice Christmas dinner. Some have business travels to attend to (yes, I know, usually planning meetings for the following year), family vacation and others are just forever busy. So, Melvin, Kevin, Walter, Vanessa and I decided to have our super early Christmas drinks last night at Red Dot Brewery. We always know we are a group of very like-minded friends and we can talk non-stop for hours – from business to fashion, trends, food and yes, gossips (about other people)! And no surprise at all when we ended up ordering the exact same food! 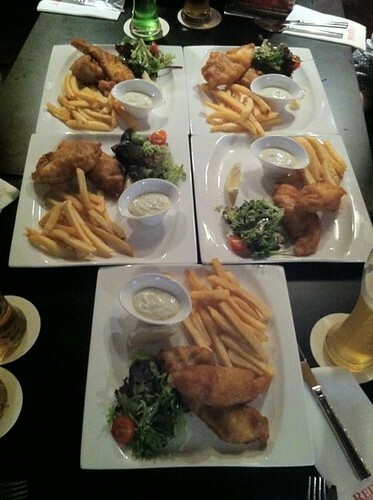 Van thought it was funny and took a photo of our five plates of Fish & Chips and tagged each of us on our Facebook. Some of my friends on FB who saw the photo asked me if the F&C was on special promotion. No, it wasn’t. Anyway, as usual, we had a great time. It was also the first time Dr. Kevin Lim managed to join us since he is now back in Singapore – for good. During dinner, Walter said I should start blogging again since I am not working now and have all the time to myself. I do feel guilty for not updating the blog. So, last night, I edited the header and re-arranged some minor features and tell myself, ok, I’ll make it a new year resolution (an early one) to start writing again. And yes, for friends who are not aware, I have left Yahoo! and I am now enjoying a nice little break. So, stay tuned for updates on this blog and let’s have Christmas dinners/ drinks! Hear ye hear ye! The woman is back in action again! It is good to start slow again and let the momentum build up. You can see, i am taking it VERY SLOWLY … I also feel my interests changing. I am a little bored of writing about similar type of topics … So, am considering expanding to more ‘lifestylish” fun stuff.